You probably don't know the work of illustrator Charles Sarka but you probably should. 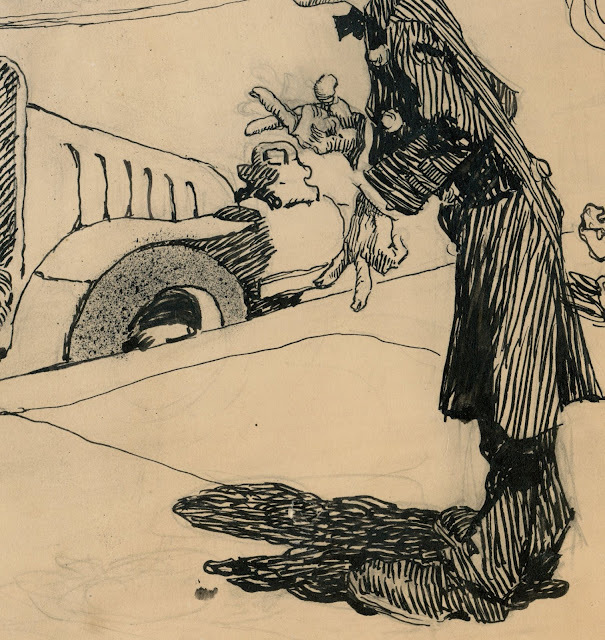 Sarka (1879-1960) started out as an apprentice to an engraver and became a staff artist for newspapers (first for the Chicago Record and then for the New York Herald). 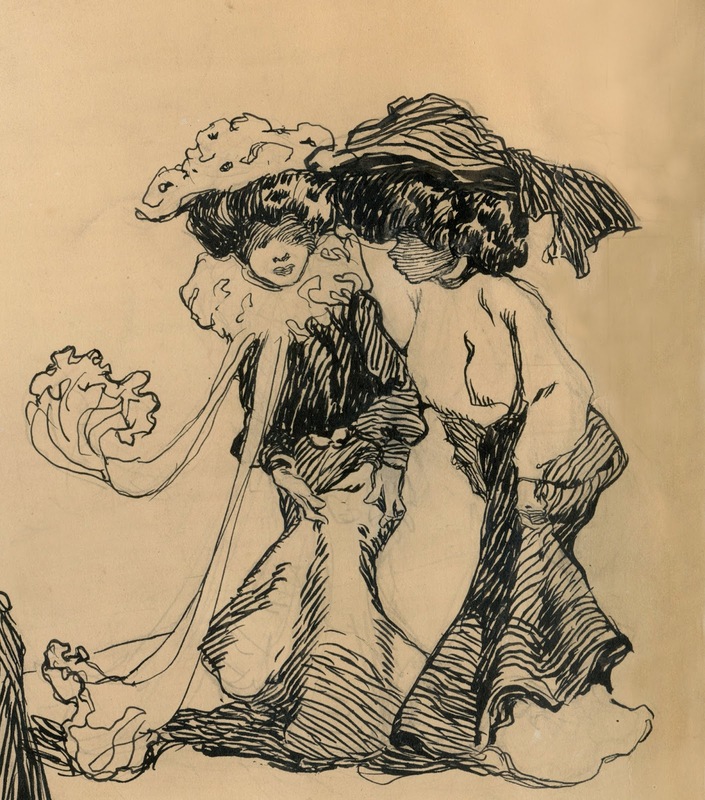 He did some lovely pen and ink work for Collier's, Cosmopolitan and Harpers in the era of pen and ink greats: Joseph Clement Coll, Charles Dana Gibson, Orson Lowell and James Montgomery Flagg. In my view, his excellent pen and ink work belongs in that esteemed company. However, unlike his peers Sarka had wanderlust. Rather than sit by his drawing board he traveled extensively to South Pacific Islands, Africa and other remote locations where he recorded his travels in watercolors. His paintings of the hill tribes of Morocco, of the natives of Tahiti and the markets of Egypt took him far from the normal career path of a typical American illustrator, so his name is not as well known. Still, I think his early ink work is excellent. 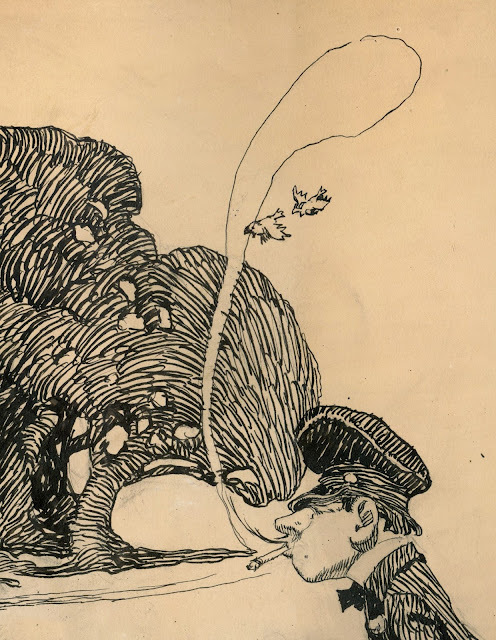 Note how Sarka gives the trees density, weight and movement by giving them heavy shadows and curling them over, (as contrasted with that cigarette smoke which wafts upward on an errant breeze-- one set of lines has to fight gravity and the other one doesn't). And speaking of lacy, Sarka applies the same lesson to these two charming ladies. They are clearly earthbound creatures, as we can tell from the volume and density in their dresses and coiffure, but that scarf wafts upward, contrary to gravity, with a different line just like the cigarette smoke. I like that Sarka put so much personality and energy in his line. I like that he understood perspective and anatomy but used them only as starting points. I like the sense of humor in his drawing. If he'd stayed home and created a substantial body of work in pen and ink, I feel certain he'd be in the pantheon today. My first impression (though perhaps less so after a closer look) was that the ink work reminded me of Heinrich Kley. It prompted me to search if you had ever done a post on him, and to my surprise you haven't, aside from a few brief references. I would love to see you write on these types of details in his work! Awesome. I never heard of Sarkas. I've long been a fan of Sarka's watercolors from the old Judge magazine, but I've seen little of his pen work. I admire the technique in this drawing but the composition is confusing. The trees, the automobile driver, and the hansom cab blend together. I had to study it a bit to figure out what was going on, especially with the cab driver, who appears to be sitting in the tree. Love this sort of work and the mentioned artists , along with F.Booth ; where form is molded with the lines . That they used dip pens to do it is remarkable . I think the brush pens etc , with less chance of wrecking a piece with a stray drip , tend to lessen an artists focus and awareness . The only guy I can think of to approach that skill , in recent times , was Wrightson - R.I.P. and his Frankenstein book . some lovely passages of ink-work in this drawing. the cartoony forms are reminiscent of TS Sullivant. i had exactly the same thoughts as Smurfswacker regarding the confusing driver area. Smurfswacker-- While I prefer the subject matter of Sarka's watercolors, I vastly prefer his pen and ink work to his watercolor work. I know his heart is in his watercolors, but they always seem a little scruffy and loose to me. 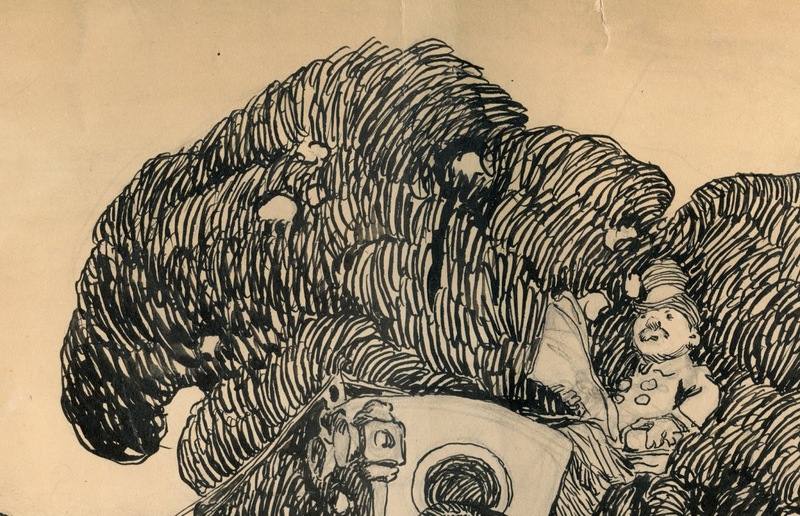 His ink drawings have a real bounce to them, and a commitment which enjoy. I understand what you mean about the composition. The original is approximately 20" x 13" and presumably would've been printed larger than it is reproduced on your monitor, which made it easier to sort out why that hansom cab driver appears to be sitting in the trees. However, even when it is reproduced too small to decipher, one of the things I like about it is the way that the components are clustered together in interesting shapes-- by visually connecting the horse to the back of the car or overlapping the head of the standing man with the trees, or by bundling the two young ladies as a separate shape off to the side, I think Sarka created a superior composition. If you looked at it at a postage stamp size, you could not figure out what was going on with the characters, but I think you'd still know there was one heck of a design going on-- stronger, I think, than the designs you'd find in the work of Orson Lowell or Franklin Booth, for example. 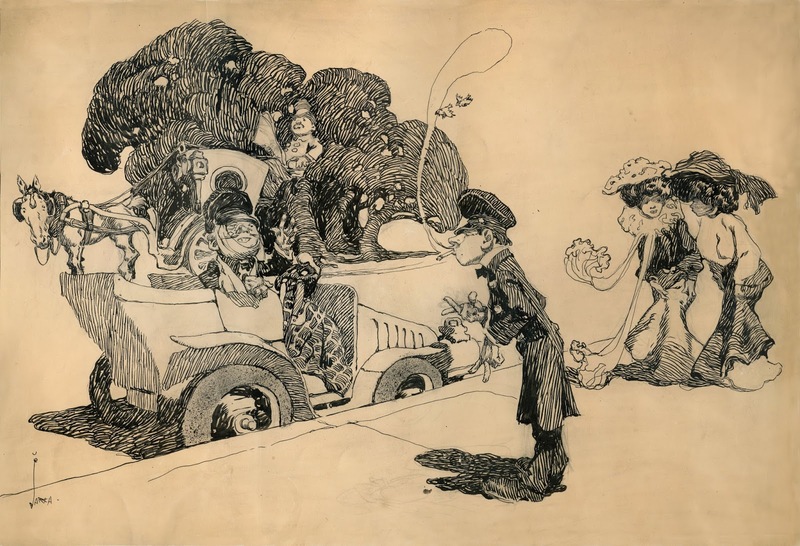 Anonymous / Al McLuckie-- I agree, that was a golden age for pen and ink work. Especially in the earlier years, magazines needed ink for reproduction purposes and artists didn't have the luxury of brush pens or Photoshop, so they had to be good; they had no alternative. Of course, sometimes those "stray drips" were put to good use (by Searle and Steadman, for example). Other greats, besides the ones that you and Benjamin De Schrijver mention, include Abbey and Frost. Laurence John-- Sullivant! Of course, another brilliant pen and ink artist, with a more primitive line than Sarka, but absolutely first rate-- inspirational and funny. Thanks for this David - a very lovely drawing indeed. It always fascinates me how the level of abstraction inherent with ink drawing means that we have absolutely no problem with the white empty spaces and unconsciously feel them to contain the rest of the world as solidly as that part of it depicted. I've been following your blog since I was a teenager (I'm 28 now). I love your taste in art and I love your writing, but find myself forgetting to visit this blog! The internet has gotten more homogenized since the mid 00s. Gone are the days of visiting 10-15+ unique websites a day. I think I visit 3 tops now. It's really akin to the death of main Street and the rise of big box retailers. Anyways, my question is have you thought about getting an Instagram ? More people would see all the hard work you put into these posts. The blogger format is great for what you do, but I'd love to see you on current social media ! Check out my work on there! Speaking of ink, your passion for it has had an impact on me! Chris Bennett-- agreed; distilling color, tone, value texture, gradation to a black line is just about the ultimate simplification. One of the very few options for this simplest of tools is where the line starts and where it ends. The best pen and ink artists end the line in a way that makes clear what's important, and implies what lies beyond (in that white space). Max Ward-- Many thanks for your suggestion. I like the idea of these pictures getting wider circulation, and it's gratifying that people scoop them up and put them on instagram, pinterest, etc. But I'm really fond of the words here; I put a note in a bottle and toss it into the ether, and sometimes it triggers the most interesting discussions. I learn new things about the artists; I learn about new artists or new styles; I hear about scientific theories; I'm frequently challenged to rethink my views or prioritize my values; I'm frequently insulted gratuitously; I often get a front row seat as others battle to the death. I would miss all that if I just put pictures up on instagram. I certainly enjoyed looking at your work, and will check in from time to time. Thanks for the link.